Endeavour started at NASA. It went to space several times over several years. 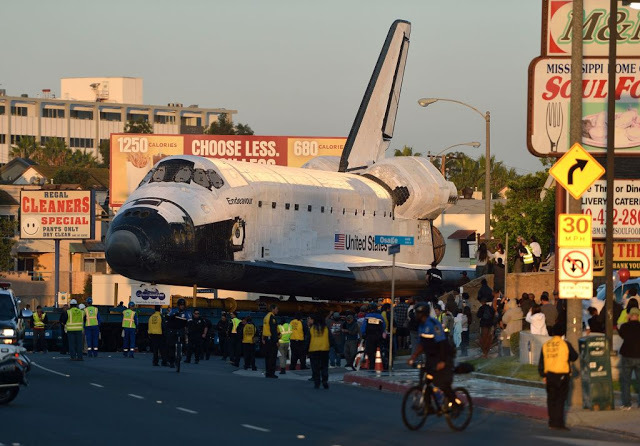 Then it went back to NASA, before it was shipped to LAX and did some fly-overs over landmarks across the nation including Griffith Park and Hollywood, and then it went back to LAX, before it was carted across town to the California Science Museum. I missed every step of the journey. I received a text from my husband, “Endeavour over Hollywood right now!” and made it out to my office parking lot just a few minutes too late. During the cross-town, pilgrimage-like (past meets present, wheels and handcarts) phase of its trek, I didn’t have a chance to drive to Culver City where its route seemed to be mapped. I missed seeing it carted along boulevards throughout Los Angeles, missed watching its wheels turn a corner while its wings nearly brushed lookers-on standing on their balconies, missed observing the careful engineering of the tow, the workers calling halt and reversing the track by two feet to get the turn right. It flew all about my mind, though. Why is it here, how many people are working on getting it from point A to point B, how long ago did they map the route, will they feel any pride after it reaches its final destination, how did the California Science Museum get it (there must have been an RFP), are the men in the orange suits LAX employees or NASA employees, were the people on the balcony scared? The LA Times posted a time lapse video of the entire local journey. It helps satiate the disappointment I felt in not having been a witness. It also fills me with pride that so many others got to see it, particularly those who live in the lower-middle class areas that this astounding thing crawled through. What a privilege.